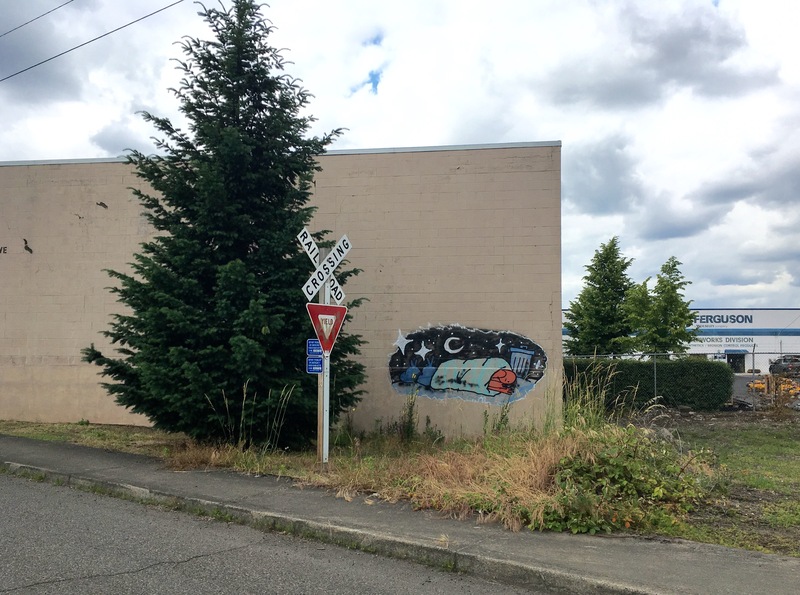 It was a gradual thing, a minimal cultural renaissance that I noticed happening outside a trio of buildings along North Columbia Blvd., an industrial collection of warehouses and blue collar businesses. I want to imagine the art in this area springing up from the businesses trying to one up each other. That would explain the three pieces of roadside art in close proximity to one another. 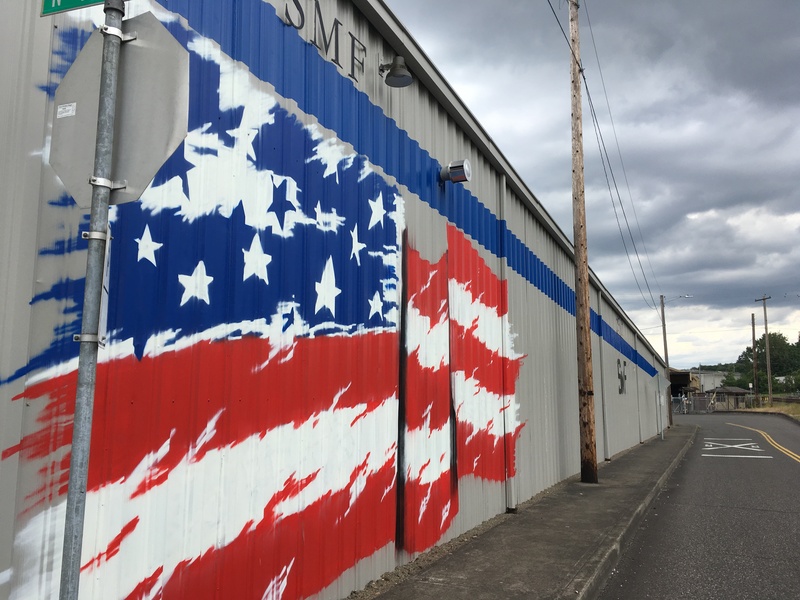 Regardless of the how and the why, without this art work, there would only be views of parking lots, weeds, railroad tracks and corrugated steel walls. The exploding American flag has always been hard to miss. Bright, bold and a tad fuzzy, the flag reveals a stylish patriotism. 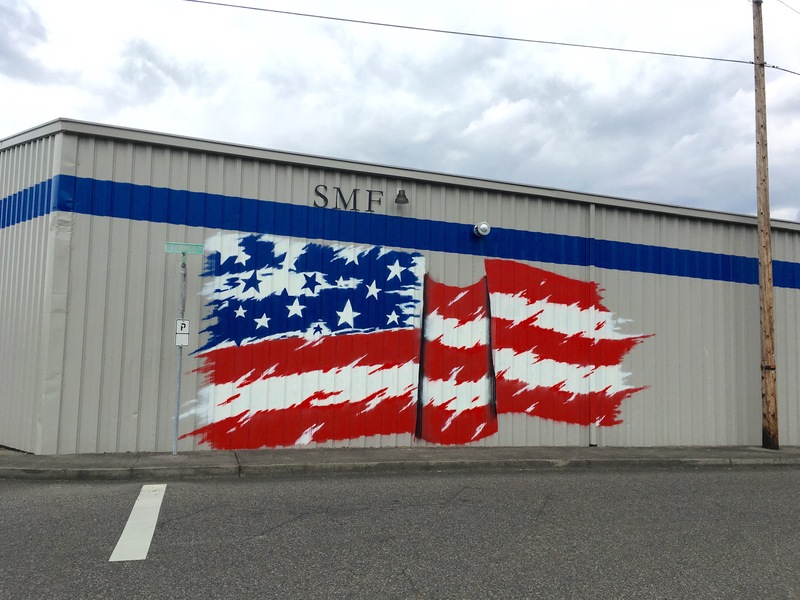 What the initials SMF on the building stand for is still a mystery as Google searches would only direct me to information about the Sacramento airport so it’s anyone’s guess how the flag relates to the business. 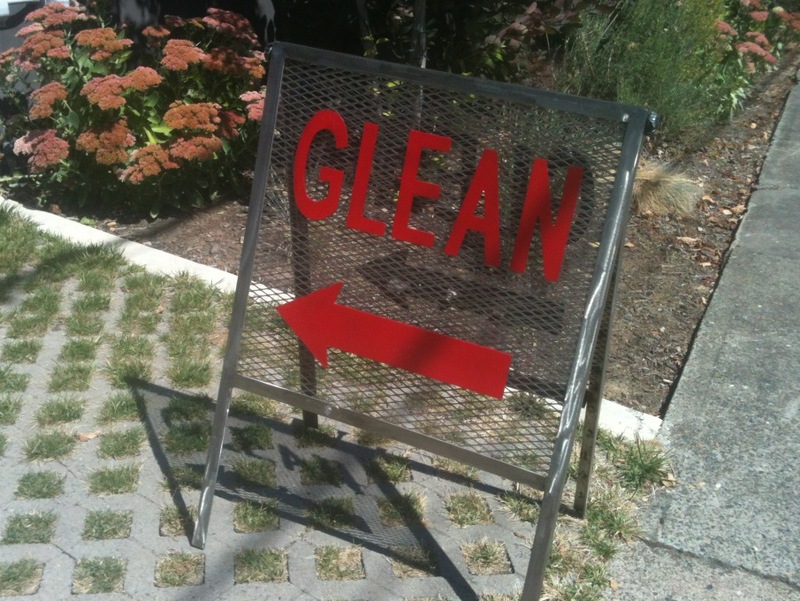 This just in: I caught a glimpse of the sign on the other side of the building. SMF stands for Specialty Metal Fabricators, not as much of a mystery as I thought. Trying to write about the flag painting technique only makes me feel like an art critic or art historian, something I’m not qualified to be. 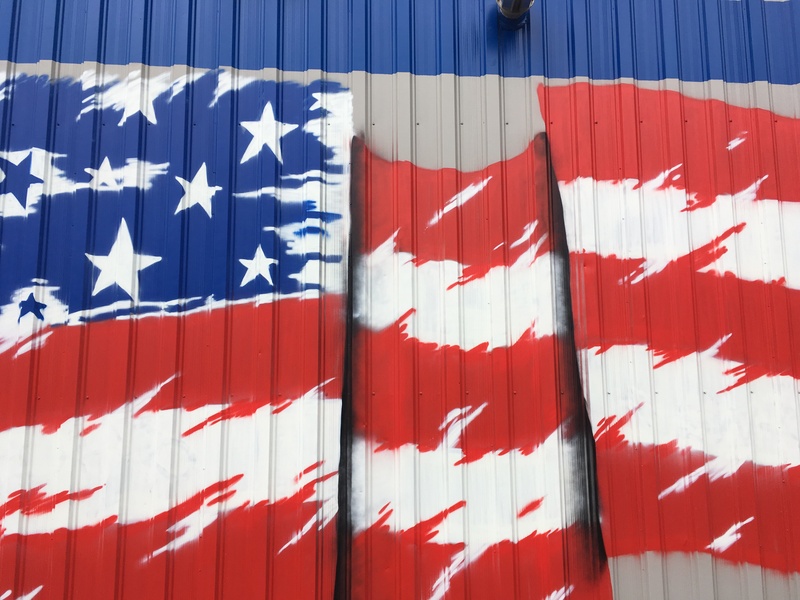 I appreciate the ragged stripes, star bursts and the 3D aspect of the waving flag revealed when I got up close and personal with this piece. There’s an energy, pizazz even (probably not an art critic word) although it wouldn’t take much to brighten up the gray skies and grimy surroundings of the Columbia Blvd industrial district. A couple of buildings down, I noticed a mural. 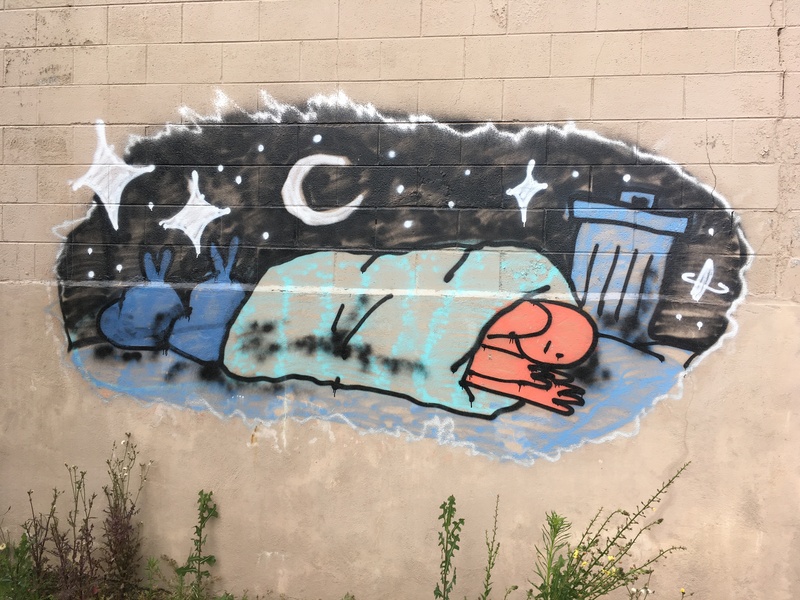 From a distance, I suspected it was making a statement about or depicting the realities homelessness. I like the train-car graffiti style and political feel. The imagery communicates the idea of humans being put out with the trash. Up close, the human is not fully detailed. I was thinking, “hotdog in a bun.” I enjoy how the painting is framed in a starry-sky dream-world. It’s also a great addition to a bland cement wall. The mantis appears to be more of a legitimate art piece. It may relate to the nondescript business inside. It reminds me of how cool praying mantises are. As a kid, I saw them as unusual, rare and exciting. They still seem exotic and more fascinating than gross. So a giant mantis is a good choice to break up a monotonous wall. 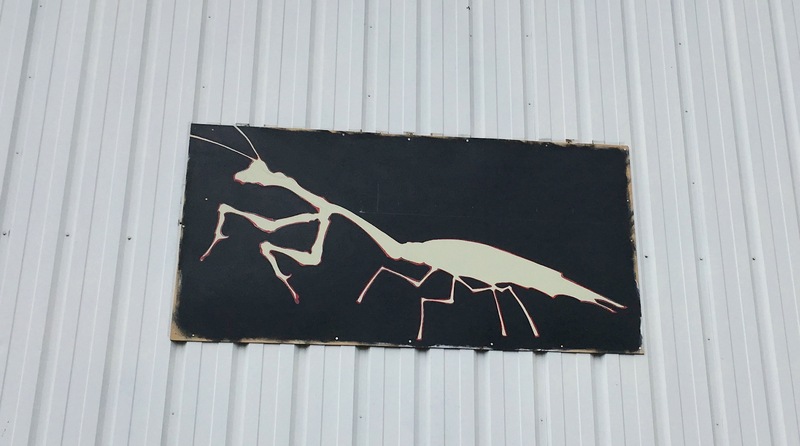 This mantis seems to be peeling off his black background – artistic effect or a cause for concern? We don’t know. The subtle red outline also adds dimension. 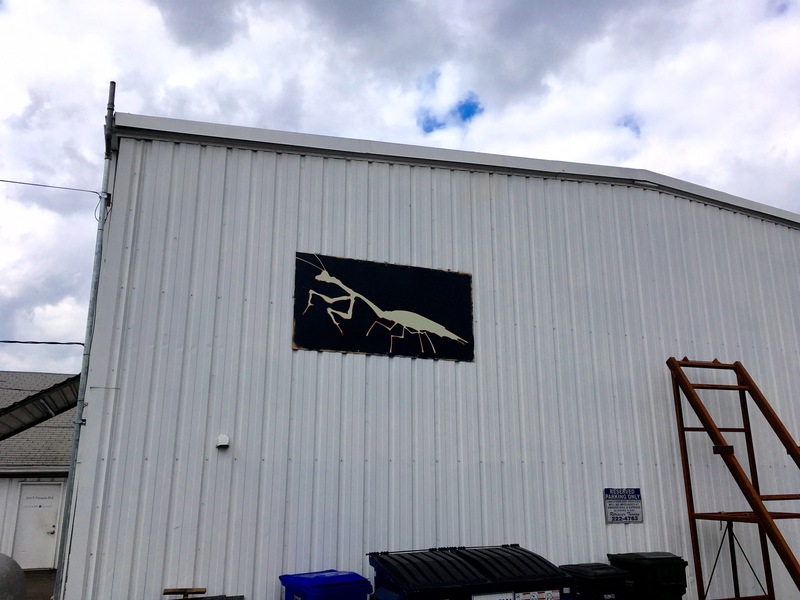 I’ve always been happy to look across the road and see this particular praying mantis. It’s art where it’s sorely needed. You can take this art walk on Columbia Blvd off of N. Argyle anytime. You don’t need a First Friday, Third or Last Thursday to have a look. You may have to dodge trains or stumble over weeds, but the tour potential is there. These works also have drive-by possibility. See the art while driving on Columbia Blvd heading towards St. Johns. Many thanks to the blog Stag Beetle Power for listing us in their favorites column. Their latest post has a great list of upcoming events so be sure to check that out. It’s great to see a new gallery rising up from the ashes, so to speak, like a Phoneix, to fill up the empty gallery space left after the closure of the Nisus Gallery. I saw Brad Nelson, who ran the Nisus Gallery, on a public access show talking about a long list of projects, none of them related to art so I knew he was a busy man. 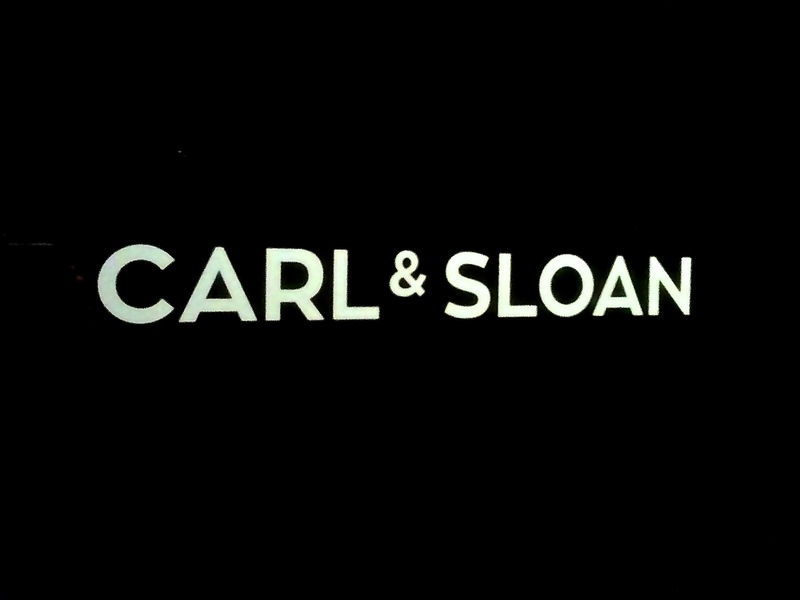 While it’s sad that the Nisus Gallery is gone, it’s a good time to welcome Carl & Sloan Contemporary to the Kenton neighborhood. I’m happy that I’ll continue to be inspired on my nightly dog walks that usually take me past the new gallery space which is housed in the Disjecta Contemporary Art Center building. , Perry Doane and Michelle Liccardo. There is still time to catch the Finster show at the Portland Museum of Modern Art located in the basement of Mississippi Records at 5202 N. Albina Ave. Portland, OR 97217. I would advise you to stop reading now and go directly to see this art, don’t make any excuses or procrastinate. I have not made it over to the show myself but it’s not to be missed. We’re talking about the Reverend Howard Finster, the eccentric, southern preacher who started cranking out primitive folk art late in his life and didn’t stop until his death in 2001. I’m biased because I like this art so much. It’s colorful, sometimes crude, but always detailed in a energetic way with stick figure angels and smiling clouds. Sometimes there’s a message to the work that’s glaringly obvious because it’s written on the painting whether it’s a biblical verse or another kind of platitude. This is a show made up of work collected by area residents. As a college student in Virginia during the 80’s it would have been difficult for me not to have come in contact with the art of Howard Finster either through album covers which used his art or by having a chance to see an amazing show in nearby Roanoke, VA. I saw more of his art on display in the folk collection of the National Gallery and his pieces were included in other folk art shows that came to the Washington DC area where I lived and there was always a painting or two of his in the shows at the American Visionary Art Museum in Baltimore, Maryland. 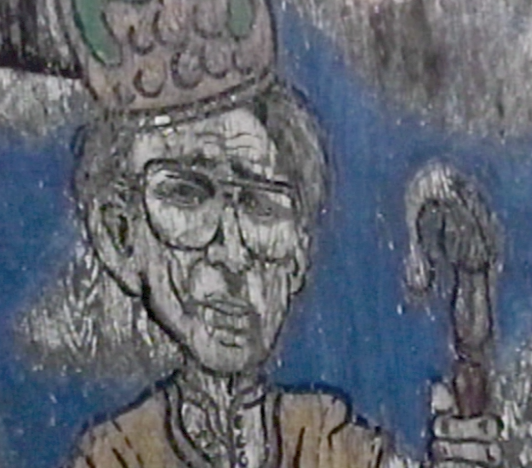 Finster’s art will be in town until March 14 so there is still time to see it. The thought of having a collection of Finster’s work on display in Portland amazes me. There’s nothing like those paintings. I was always captivated by that wild southern spirit of Howard Finster. He was all kinds of charming, yet mysterious, which had me wondering where his creativity was coming from and how it had been inspired. I could never forget the video of him as he told the story of how he got paint on his finger and when he looked at it there was a face that told him to paint sacred art. Paradise Gardens, his home compound seemed like a mythical place with folk art cut outs sprouting out of the yard like mushrooms. I was glad to be able to visit in 1998 and tour the grounds and years later happy to hear about the major restoration that has since taken place. Get to the show. You’ve waited too long already. Here’s some additional memories inspired by Finster. 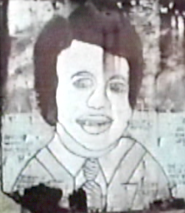 He’s not the type of southerner I would have encountered as a kid living in the Atlanta area in the early to mid 70’s but his portrait of Jimmy Carter I saw while reviewing footage of Paradise Gardens had me flashing back to the good old days. I must have been impressed with Carter because my big brother, Jack, went on a school field trip to the Atlanta state capital and saw then Governor, Jimmy Carter, hard at work at his desk and then soon after he became president. We moved to Washington D.C. two years later and went to Carter’s inaugural parade. In a lawyer’s office, looking down on Pennsylvania Avenue, we saw Jimmy take to the streets with Rosalyn in her teal coat and a then 9 year old Amy Carter skipping around. Jimmy was too nice a guy to be president for long. I mean the dude isn’t getting much respect from me as I’m using his first name. He used to get on TV and tell us to turn our thermostat down and wear sweaters to conserve energy. Carter was the first president to put solar panels on the White House so I guess he was on to something. Jimmy Carter jumped ahead of the other notable Georgians I remember from my childhood like Lester Maddox, not a hero, but an oddball who ran a strange newspaper advertisement for what I recall was a restaurant. I later adapted the ad for a book report. “Lester Maddox says read Stuart Little.” And there was James Oglethorpe who probably was more of a hero type. I immortalized him in a diorama for a school. I’m used to checking out the goings on in the Nisus Gallery which shares space with Disjecta. I’ve seen artists hanging shows but this week I was surprised to see the artist creating art for the show on one of the walls. My dog Max stop to sniff long enough to let me snap a photo. 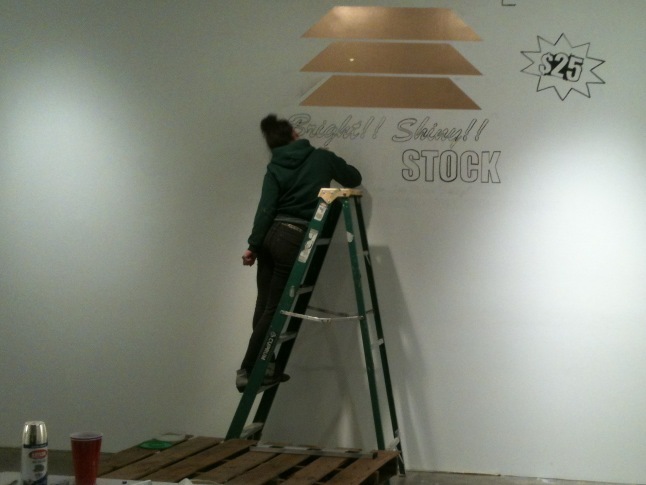 The preparation was being done for a show called Gotta Make Money to Make Money which will be on display at Nisus Gallery from November 21, 2014 to January 16, 2015. There is an opening reception Friday, November 21 from 6pm to 9pm. The Nisus Gallery is located at 8371 N Interstate, Studio 1, Portland, OR 97217. The Gallery is open Friday through Sunday, 12:00 to 5:00 pm and by appointment. I’d seen Allan Ostermann’s art in the Triple Crown Market in Kenton, peeling off the back wall, immortalizing Kurt Cobain and Susanna Hoffs from the Bangles, among others. Then there was the feeling that his Lou Reed portrait was staring at me from the glass window of Smoke it Up a couple of stores down. 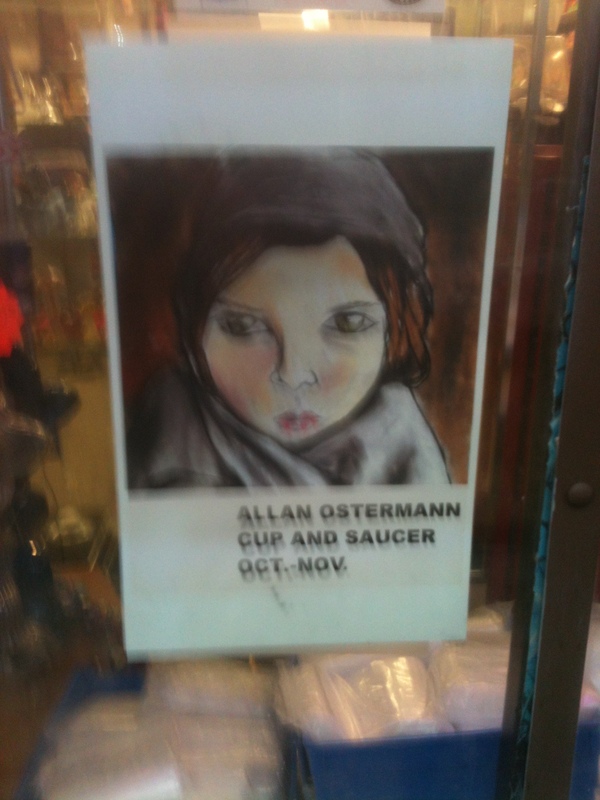 It was good to see Ostermann’s work hanging in the Cup and Saucer on North Denver Avenue after these appearances in the neighborhood. 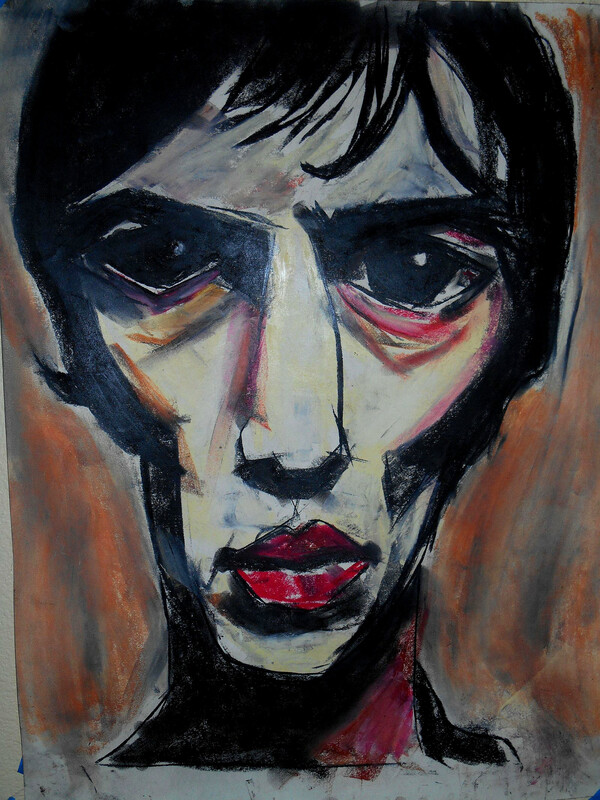 Ostermann’s main focus for this show is images of faces. Faces with large eyes, sometimes a tiny bit too far apart, haunting, angular and stylish. I appreciated the mix of celebrities like Eddie Vedder and Willie Nelson along with faces I thought I should know like what appears to be a 40’s movie starlet in her black and white glory with a subtle off-kilter look to her eyes. The hallucinogenic color distortions of the faces appealed to me and I was glad to see his art in a more formal art show setting. The show runs into the middle of November at the Cup and Saucer, 8237 N. Denver Ave, Portland, OR. Ostermann sells 11 x 17 prints of his works for $20. A hurried shot of the show poster.